Allow me to connect the dots to explain how the decision of the S.A. Supreme Court of Appeal (SCA) in the canned hunting case could contribute to the extinction of wild lions in S.A.
To recap, the Minister for the Environment (at that time Van Schalkwyk) tried to impose a 24- month wilding rule on the captive lion breeders in the TOPS regulations (TOPS = Threatened Or Protected Species Regs). 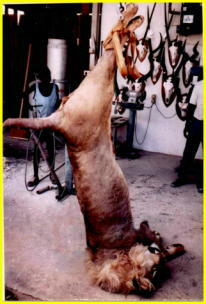 The Predator Breeders (lion farmers who supply the canned hunting industry) objected and sued the Minister. They lost in the High Court but on appeal to the Supreme Court of Appeal (S.C.A.) they succeeded, and the 24- month wilding rule, which sought to restrict the hunting of tame lions to those who had been released into a large camp with a natural prey base for a minimum period of 24 months, was set aside. So currently there is no protection for lions under the TOPS regulations, the number of captive lions has increased to 8,000 and canned lion hunting is a booming industry. The SCA allowed the appeal of the lion farmers on a very specific point. The judges raised the point mero motu i.e. off their own bat. The SCA held that lion farming was “a closed circuit” i.e. that since no captive bred lions have ever been released back to the wild, then lion farming had nothing to do with conservation. Accordingly, the Minister for the Environment had no jurisdiction to impose any restrictions on them. Lion breeders were farmers, not conservationists. On that tardy and narrow point, the lions lost. Now the problem with a decision based upon a new point raised mero motu by the Court itself, is that the lawyers are caught off guard and unprepared. This point was never argued in the Court below, and the papers were not drafted by lawyers with this point in mind. I personally filed an affidavit in support of the Minister, at the request of the State Attorney, but was asked to limit my input to the issue of the potential loss of income from foreign tourism caused by ethical tourists boycotting S.A because of their outrage at the institutionalised cruelty to lions. Had the State Attorney been aware of the point that the S.C.A. would use to decide the case on appeal, I could have expanded my affidavit to show that canned hunting is not a “closed circuit” and that it adversely impacts on wild lion populations in various ways. First, captive lions suffer from both inbreeding and captivity depression. Lion farmers need to bring in fresh blood continuously, and that means that wild lions are often captured (illegally) for that purpose. Anecdotal evidence is that there is routine smuggling of captured predators from Botswana. I have even been told of one car chase near the Botswana border where the smugglers were seen throwing live cheetah out of the vehicle during the chase, so that they would not be caught in possession. Second, there is the growing lion bone trade, which is a grim spin-off from lion farming and canned lion hunting. It is much cheaper for the lion bone traders to buy the bones of poached lions than to pay, say, US$165 per kilo to the lion farmer. Further, Chinese buyers prefer the bones of wild lions because these are regarded as more ‘potent’. So, legalising the lion farming / canned hunting business will cause an escalating poaching of wild lions to meet the growing demand from an established, legalised lion bone industry. Third, there is the corruption of data on which hunting licences are granted by neighbouring countries. Cannned hunters are nothing if not vain, and they want their trophies to be registered in the Rowland Ward trophy book, to give themselves bragging rights. But Rowland Ward will not recognise South African trophies because they know that these are from captive bred lions. So some resourceful lion farmers get around this problem by flying the trophy animal - often darted and in the same aircraft as the intrepid hunter - into a bush strip in a neighbouring country such as Mocambique. There the dazed animal is shot, and the trophy exported as a Mocambique lion. As more and more lions are exported from Mozambique in this way, and the Moz authorities do not see any substantial impact on their own wild lion prides, they will be tempted to increase hunting quotas of wild lions, misled into believing that there are more wild lions than in fact they do have. Lion farming for canned hunting is a toxic industry which is going to poison lion conservation throughout Southern Africa. I think that the decision of the Supreme Court of Appeal was wrong and shows the dangers of deciding cases on new points raised for the first time on appeal by the appeal court itself. And I believe that this poor decision will contribute towards the ongoing collapse of Southern African wild lion populations. In the wild, there are more rhino than lions, although one would not think so from the hysteria over rhino. We must not be distracted from the plight of lions and elephant and others.